Hands-free backup of files and folders on your Mac; customized backup scheduling and reporting options; 24 x 7 access to backed up data via the web. Backup data from multiple computers to a single account. Protect your Mac - by backing up the Time Machine data. Optimal bandwidth utilization by compressing data and transferring only modified portions of files. Automatic backup of critical data including Desktop, Downloads, Documents, Music, Movies and Pictures. Securely share files / folders for collaborative access over email, Facebook and Twitter. Secure local storage for your business data that complements your cloud backup, and ensures speedy restores. Provision to regulate the Internet bandwidth usage with the Bandwidth Throttle. You can set your Mac to automatically shut down after the backup is complete. Provision to restore the last 10 versions of files maintained in the IBackup account. Data is transferred and stored using 256-bit AES encryption with a user-defined key, known only to you. Web-based console helps you manage data backups, schedule, restores, application settings and more, on your distant computers. 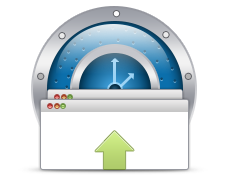 Perform interactive backup / restore or schedule backups for a future date and time. Provision to recover the deleted files / folders from Trash within a period of 30 days. Backup data from the mapped / network / external drives, by adding it to the Backup set and having the drives available at the time of backup.